As we left the harbor, it looked like a major float-fest going on. It was certainly a beautiful evening: clear and sunny but verly little wind filling in from the East. We set the course to the shortest Easterly wind course, cut in half. Start to Blacks and back. Catalinas out this night were: Pair A Dice, Aeolian, Free Spirit, Emeritus, Iris and Pacific Spirit. Joining along were Homer in his C&C 25 and Chappy in his Erickson 35. We gave the Catalina 27's a 2 minute headstart. Somehow, Homer absolutely nailed the start right on time followed closely by Iris. For the 30's and larger boats, Pacific Spirit beat us to the line and we were left with dirty air. Emeritus started further down the line in clear air and was clipping along nicely. Light air sailing is always and challenge, especially when you are being blanketed by your competition. Pacific Spirit sure is a pretty boat, but I enjoy looking at her from her bow rather than her stern! I had Fred Molnar on the helm and he did an excellent job of climbing above Pacific Spirit to get clearer air. Despite his efforts, we still rounded behind Pacific Spirit. As we were fighting it out, apparently Homer rounded Black on the wrong side, and had to go back to round again. Maybe, Homer has determined that the blue course card is too much weight for his boat? He was still sailing very fast. After rounding Blacks, we were off for the start mark, following Homer, Iris and Pacific SPirit. Homer took start to the wrong side and Iris won, with Pacific Spirit second and Pair A Dice maybe 3 seconds behind Pacific Spirit. Way to go IRIS. 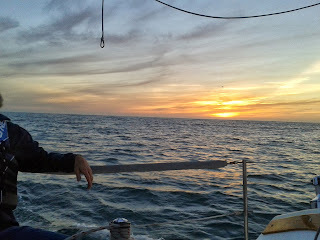 After the race was over, there was still some light, so we sailed out about 2 miles and ran into a pod of whales. Beautiful sunset and whales blowing all over the place. It just doesn't get much better than this. "It doesn't get much better than this"???. 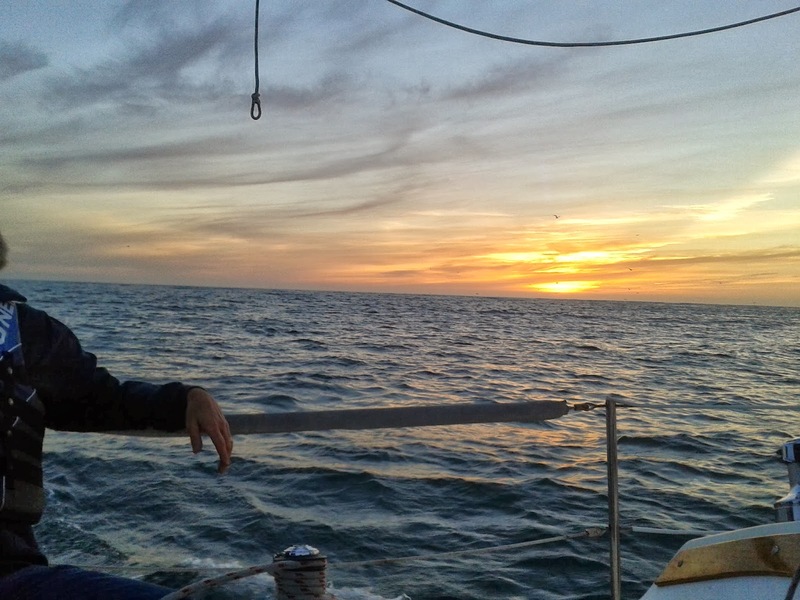 Steve Nieman shared photos from the Wednesday night sail. Where we saw whales spouting and some backs coming out of the water, check Steve's photos out.